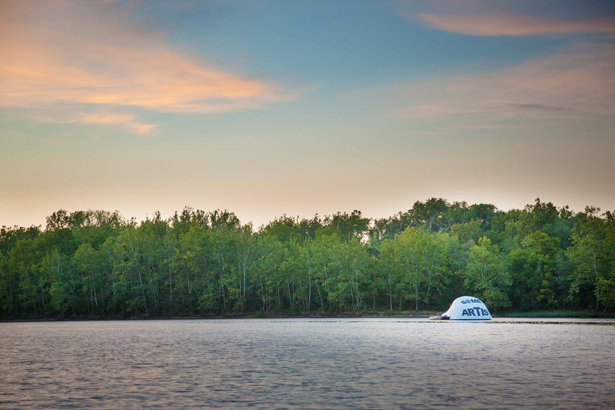 The Indianapolis Museum of Art is issuing a call for proposals for a six-week summer 2013 residency on Andrea Zittel’s Indy Island within the IMA’s 100 Acres: The Virginia B. Fairbanks Art and Nature Park. Graduate and undergraduate students and professionals in the fields of art, design, architecture and performing arts are encouraged to apply to customize and reside on Indy Island. Anchored in the 35-acre lake within 100 Acres, Indy Island is a habitable, “off-the-grid” structure accessible by rowboat. At about 20 feet in diameter, the island serves as an experimental living structure that examines our daily needs. Residents collaborate with Zittel by adapting and modifying the island’s structure according to their individual needs. • In 2010, Herron School of Art and Design (Indianapolis) students Jessica Dunn and Michael Runge activated the installation through a series of visitor interactions based on a system of exchange with their project titled Give and Take. • The 2011 island resident was Katherine Ball, a student of Portland State University’s Art + Social Practice MFA program (Portland, Oregon). Over the course of her residency, titled No Swimming, Ball initiated a series of ecologically remedial interventions in the Park’s lake and engaged a local audience through a series of public programs centered on the topic of water. • For his 2012 residency titled INDIGENOUS: Into the Wild with A. Bitterman, Kansas City-based artist A. Bitterman created a series of sculptural interventions throughout the Park that prompted visitors to question their relationship with “the wild.” To further this inquiry, Bitterman acted as an element of nature himself, and relied on visitors for food and refrained from verbal communication. It’s important that the 2013 residency addresses concerns not previously explored. There must be a strong rationalization for why the proposed project must take place on Indy Island. Proposals that don’t specifically relate to the island or 100 Acres will not be considered. Apply for the residency at www.imamuseum.org/islandresidency. There, applicants can find photos and renderings of Indy Island, as well as further details about the selection process. Proposals are due Friday, January 11, 2013, and should include a brief written statement and renderings of the proposed project. The residency must last six weeks or longer and be conducted between May and September 2013.